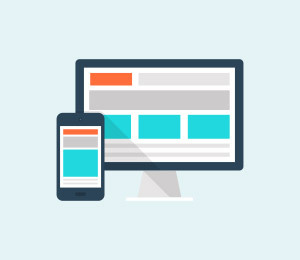 Apps not working or stopped while working, such as unfortunately Netalpha has stopped or unfortunately the internet has stopped, is a very confusing error because one moment your App is running smoothly and the next moment it shuts down automatically with an error message. Unfortunately, Youtube has stopped working, unfortunately, Netalpha has stopped, unfortunately, internet has stopped, and much more such examples of Apps stopping while working normally are witnessed by users all over the world and they are constantly on a lookout for solutions to fix such an error. 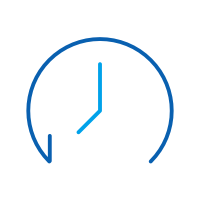 Read on to find out why exactly your App stops working suddenly and 3 of the best and most effective ways to tackle the problem. Part 1: Why your App stops working suddenly? Unfortunately, Youtube has stopped, unfortunately, Netalpha has stopped working, etc are error messages that pop-up every now and then while using Apps on Android mobile devices. It is important to understand that such errors are not App/Apps specific and may occur with respect to any App/Apps. There is no one specific App or genres of Apps which face this problem. The reason behind unfortunately internet has stopped or any other App which experiences such a glitch is data crash. A data crash is not a serious problem and only means a situation wherein an App, OS or a software stops working normally and exits abruptly. This may happen due to various reasons such as unstable internet connection, both cellular, and WiFi. 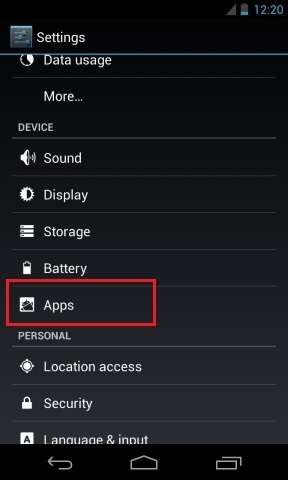 Another reason for Apps to stop working could be corrupted Cache files which have not been cleared in a long time. Many users also feel that incomplete or improper installation may cause the App to crash and stop working suddenly. There may be much more reasons for the, unfortunately, App has stopped error to show up but no one reason can be blamed for it. 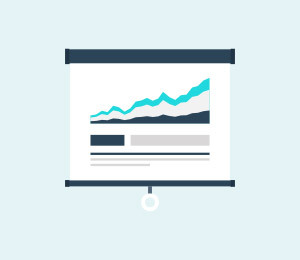 Therefore it is important for us to carefully examine the problem and choose from the solutions given below to fix Unfortunately Youtube has stopped, unfortunately, Netalpha has stopped, unfortunately, the internet has stopped and many other similar unfortunately App has stopped working errors. 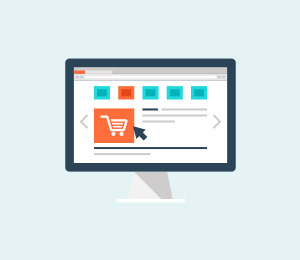 Fortunately, while this is an annoying problem that stops you from doing what you’re doing, the best way to eliminate this error is simply to repair the data glitch, thus preventing it from happening. 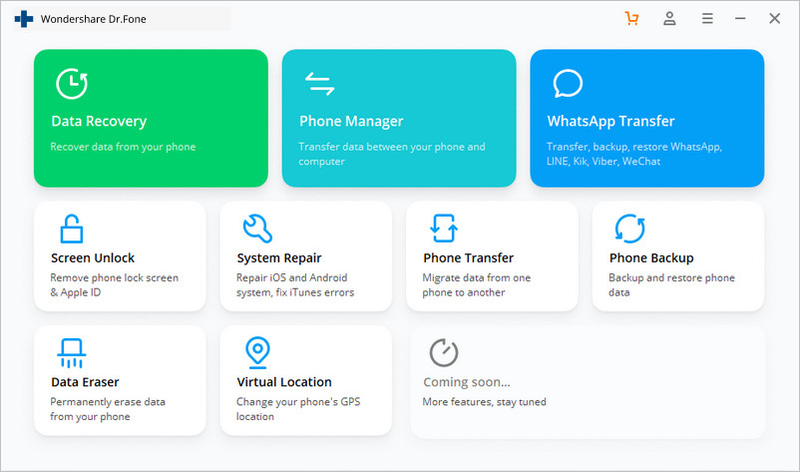 The easiest solution is to use a software application known as dr.fone - Repair, a specialist piece of programming designed to help you fix your devices as quickly as possible. If this sounds like the option you need to alleviate your unfortunately YouTube has stopped errors, this is how to use it. 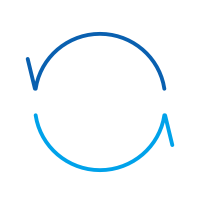 Note: Please note that using this solution may rewrite and repair all data on your phone, meaning there is the potential to lose data during the process. Make sure you back up your device before continuing. Head over to the dr.fone - Repair website and download the software to your Mac or Windows computer. 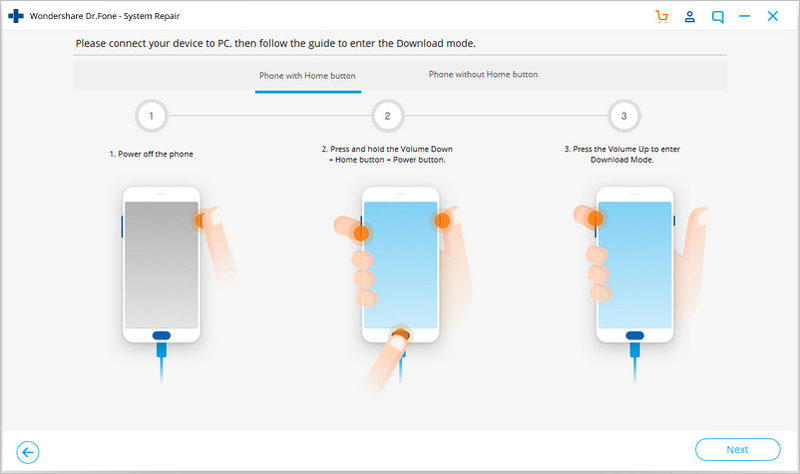 Launch dr.fone and click the Repair option from the main menu. Now connect your Android device using the official cable. From the next menu, select the ‘Android Repair’ option and press ‘Start’. Tap in your phone information. This is to make sure your device is repaired in the correct way while minimising the risk of bricking your device. 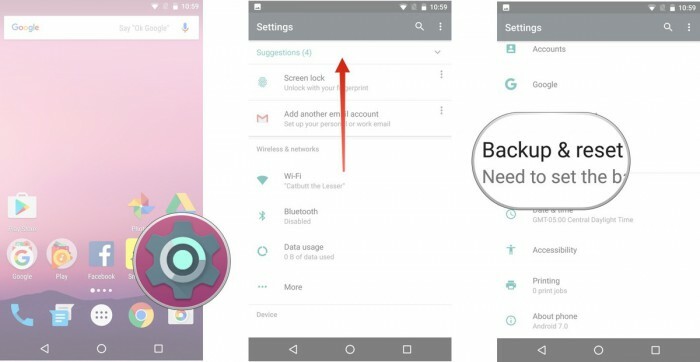 Follow the on-screen instructions on how to then boot your Android device in Download mode. 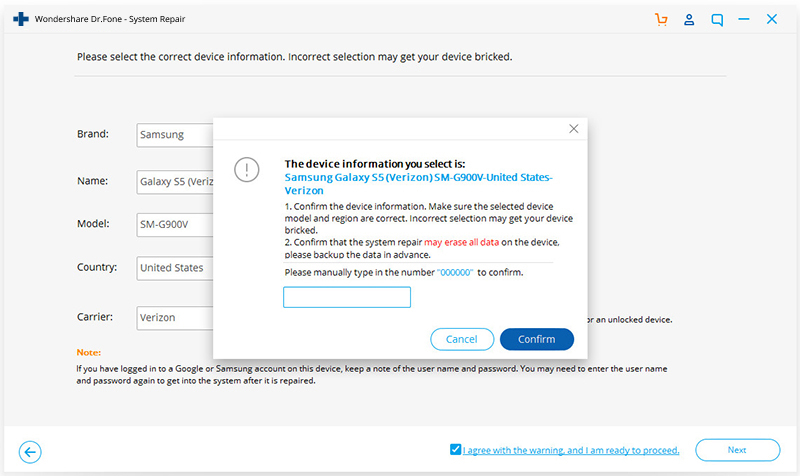 Once booted, the software will verify your firmware and start repairing your device. Make sure your phone stays connected throughout the process and you’ll be ready to go and your ‘unfortunately the internet [or other app] has stopped’ error should be erased! This could take some time, depending on your internet connection and speeds, so be mindful that everything stays connected. Herein we bring to you 3 of the most effective remedies to combat the, unfortunately, App has stopped error which has helped many users facing similar problems. First among these is to clear the App’s cache. 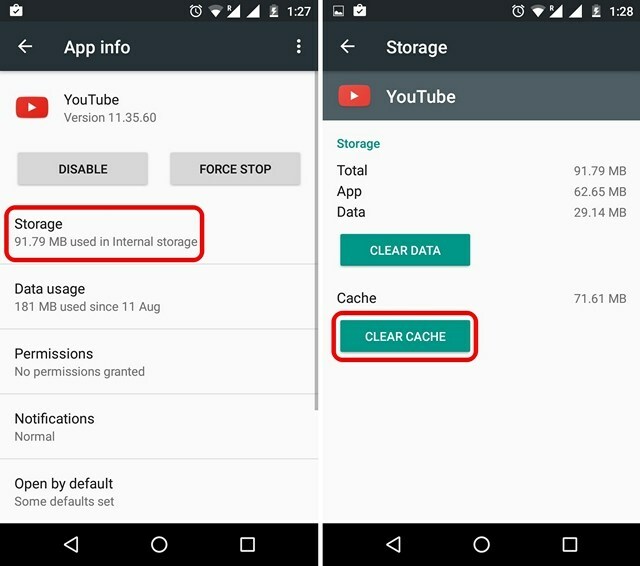 Clearing App cache to fix Unfortunately Youtube has stopped, and such errors are very popular as it cleans your App/Apps by wiping off data which has been stored due to constant App usage and it makes the App/Apps as good as new. It is advised to all users to clear the App cache regularly for Apps to function better. •	Visit “Settings” to find an option named “Apps”. •	Tap on “Apps” and look for the App which has suddenly stopped. •	Click the App name, say for example “Youtube” by scrolling down in “All” Apps. •	From the options that appear, tap on “Storage” and then on “Clear cache” as shown below. Clearing App cache is always a good idea as it prevents any errors which may be caused due to the cache being corrupt or too full. This method is likely to help you but if the problem still persists, read on to find out about 2 more solutions. Sometimes, unfortunately, Youtube has stopped, unfortunately, internet has stopped and such errors are caused due to improper or inappropriate App installation. It is mandatory to completely download the App from the Google Play Store and use it after it is successfully installed on your device. 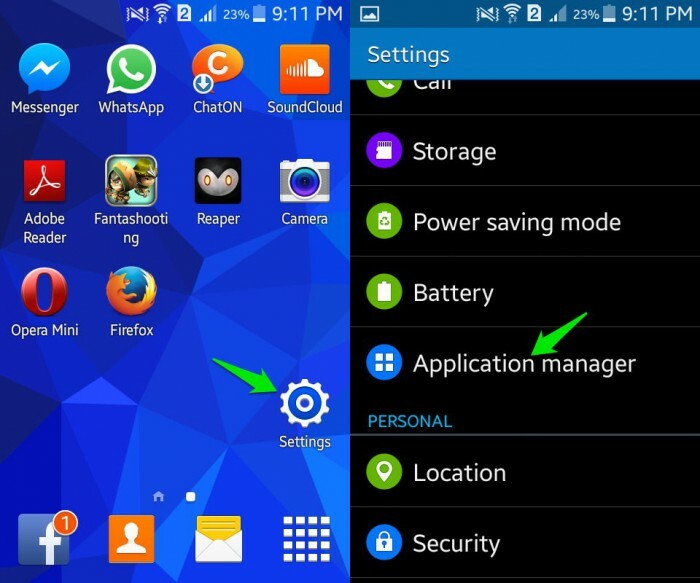 •	Visit “Settings” and search for “Application Manager” or “Apps”. 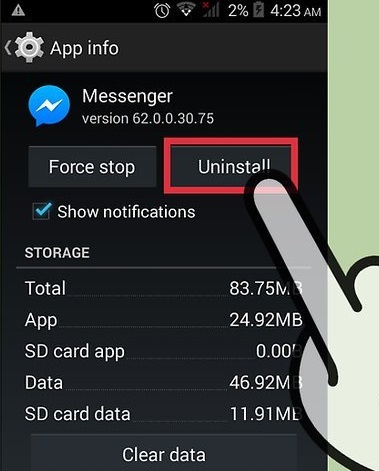 •	Select the App you wish to uninstall, say for example “Messenger”. •	From the options that appear before you, click on “Uninstall” to delete the App from your device. 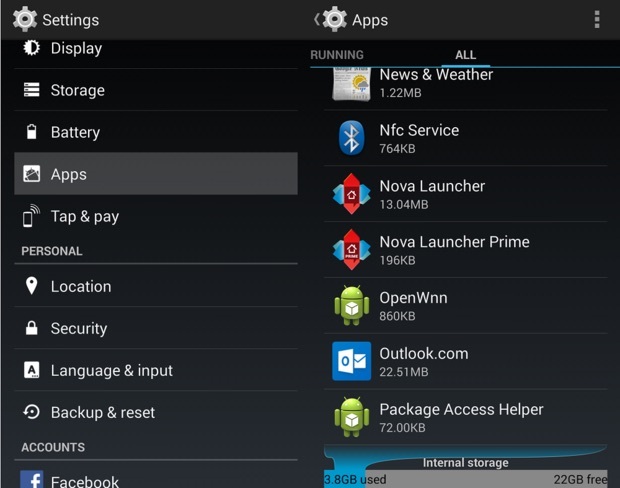 You may also uninstall an App directly from the Home Screen (only possible in certain devices) or from the Play Store. To re-install the App, visit Google Play Store, search for the App name and click on “Install”. You will also find the deleted App in “My Apps and games” on your Play store. This method has helped many and will definitely be useful to you too. So don't hesitate to try it. 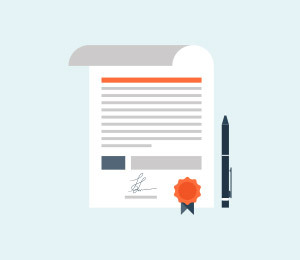 It may sound tedious and time-consuming but it hardly takes 5 minutes of your time. Factory Reset must be used only when nothing else works. 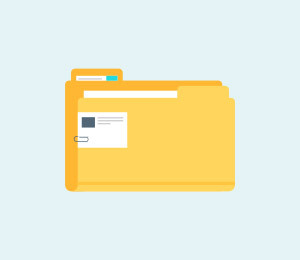 Please remember to take a back-up of all your data and contents on the cloud or an external memory device, such as a pen drive before adopting this method because the one you perform a factory reset on your device, all media, contents, data and other files are wiped out, including device settings. 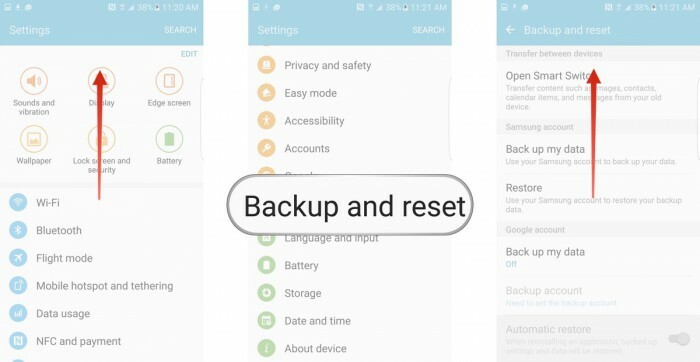 Do remember to backup the data on Androie device before performing factory reset. •	Visit “Settings” by clicking the settings icon as shown below. •	Now select “Backup and Reset” and move on. •	In this step, select “Factory data reset” and then “Reset Device”. 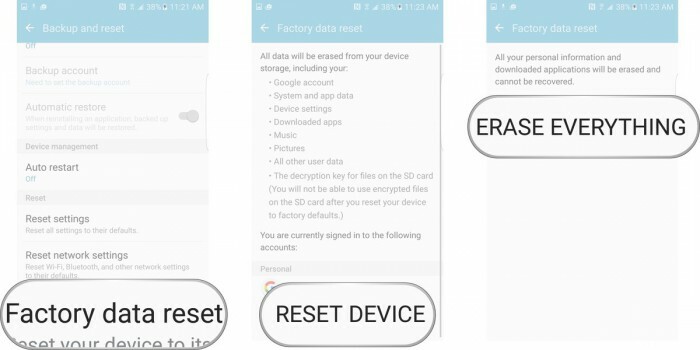 •	Finally, tap on “ERASE EVERYTHING” as shown below to Factory Reset your device. Note: Once the factory reset process is complete, your device will automatically restart and you will have to set it up once again. Errors such as unfortunately Youtube has stopped, unfortunately, Netalpha has stopped, unfortunately, internet has stopped working and so on are very common these days. They disrupt the normal functioning of an App/Apps and prevent you from using the App/Apps smoothly. 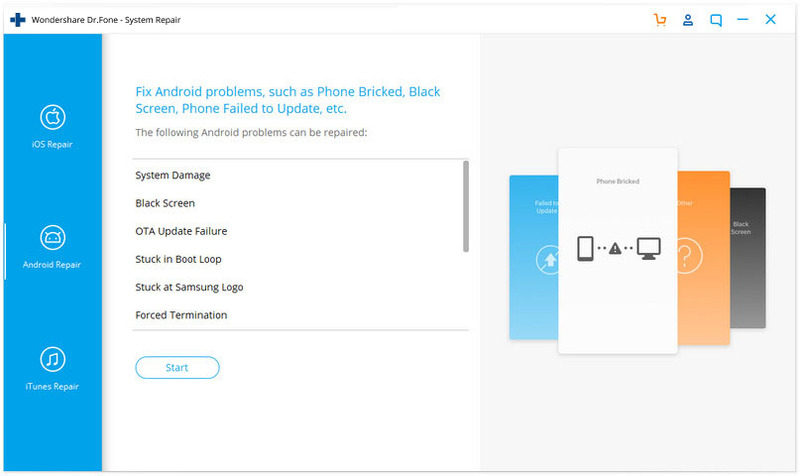 Unfortunately, App has stopped error is not a serious problem and does not mean there is a problem with the App, your Android OS version or your handset. It is a random error which occurs due to various reasons in given situation. If you experience such an error while sign in your favorite App/Apps, DO NOT panic as unfortunately, App has stopped error can be fixed easily. 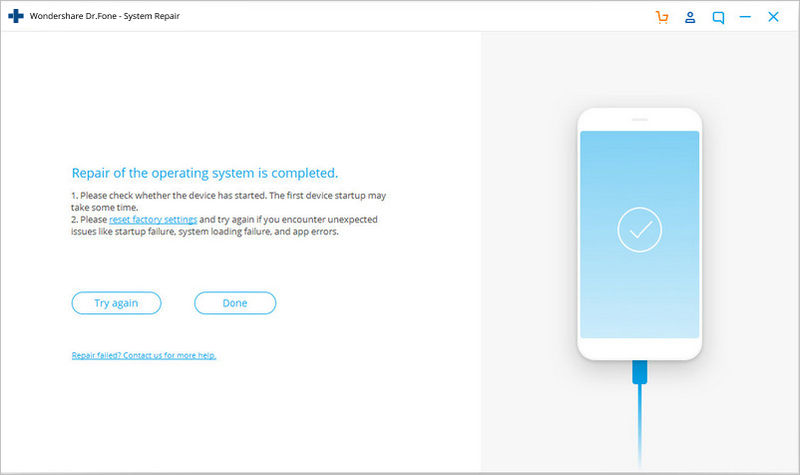 All you need to do is be patient with the App’s software and not try to launch it again and again once it crashes and an error message pops-up. Just follow the methods listed and explained in detail in the previous segments to solve the problem of unfortunately App has stopped. Learn how to overcome Wifi authentication error in this extensive post. We have listed stepwise solutions to fix authentication error occurred on Android. 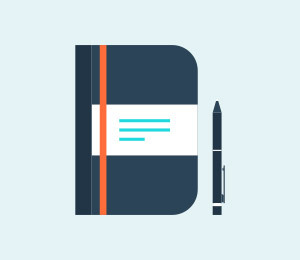 Learn how to resolve the process system isn’t responding issue on your device. We have listed 4 different solutions to fix process system not responding error.